Three innings after a foul ball struck his facemask, Marty Foster left Thursday's assignment due to injury. 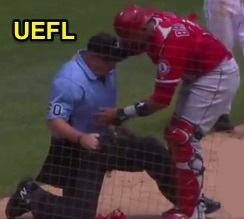 Head hit stuns HP Umpire Marty Foster in Detroit. In the bottom of the 3rd inning of the Angels-Tigers game, Tigers batter Pete Kozma fouled a first-pitch 91.7-mph sinker from Angels pitcher Andrew Heaney into the the center portion of Marty Foster's traditional-style facemask. 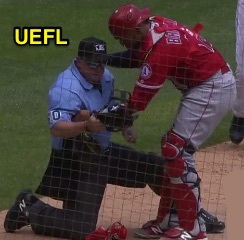 Foster remained in the contest following the traumatic hit, but left the game in the middle of the 6th inning as 2B Umpire and Crew Chief Greg Gibson took over behind home plate, leaving 1B Umpire Mark Ripperger and 3B Umpire Doug Eddings to work the bases. Relevant Injury History: In June 2015, Foster exited a game in New York following a foul ball injury to the chin area. Similar to Thursday in Detroit, Foster completed the half-inning during which the injury occurred before leaving the game during a subsequent inning break. Related Post: Marty Foster Leaves Game on Foul Ball Injury (6/16/15).